Prof C. Das was the former HOD subsequently Principal of Silchar Medical College as well as former Director of RIMS, Imphal. He was a Dr B C Roy awardee and member of MCI. Prof C. Das was one of the pioneers of the ENT fraternity of North East India. He was a great teacher and also fatherly figure to the student. It was great loss to our society which will be hard to be filled up. He will always be remembered for his contribution to the field of otolaryngology of N.E. India. 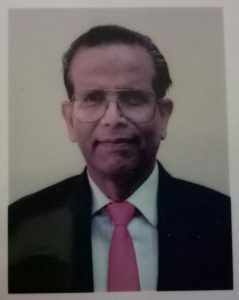 The members of NEBAOI offer deepest condolences to the family of Prof C. Das and pray to God Almighty for the eternal peace of the departed soul in heaven. North Eastern Branch of the Association of Otolaryngologists of India (NEBAOI) is one of the oldest associations of ENT Surgeons.NEBAOI was formed in April 1985 in Assam Medical College, Dibrugarh during the 2nd conference of all ENT Surgeons from North East Region.